As teenagers in Libya, Mohamed Hassan and Youssif Taher often saw dead bodies lying in the street. The North African nation where their Sudanese families settled has long been torn apart by conflict. The 40-year rule of Muammar Gaddafi, described as one of “institutionalized chaos,” ended in 2011 with the military dictator’s capture and execution. Since then, several factions — including Islamic State — have battled for control of the oil-rich country. The United Nations (UN) has described Libya’s current state as “one of near anarchy,” with civilian kidnappings, torture and mass killings commonplace. When their primary caretakers (Hassan’s father and Taher’s uncle) both died, the youths — then just 15 years old — knew they needed to escape, especially since “Libya wasn’t a very good place to be if you’re Sudanese,” said Samuel Abu, the community development coordinator for the Refugee Resettlement Program of archdiocesan Catholic Social Services (CSS). 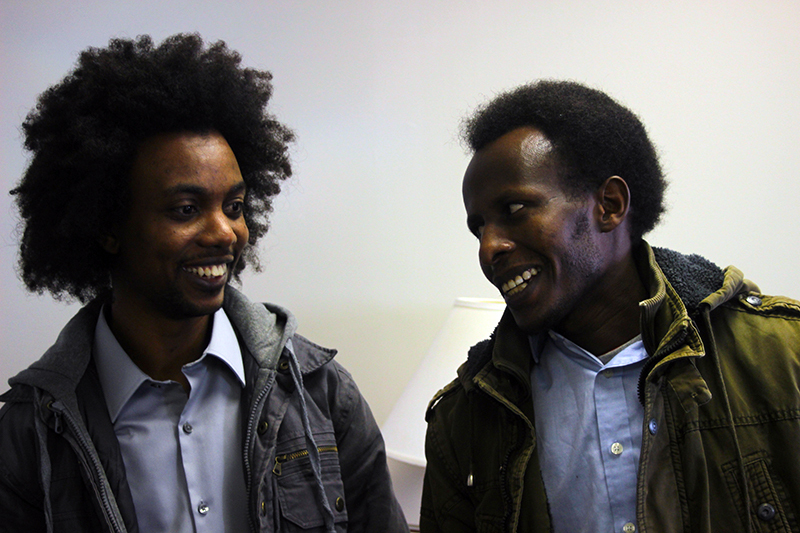 Now 21, Hassan and Taher (who did not know each other in Libya) recently met with Abu at CSS’s Family Service Center in Chester, where they recalled how they had each made their way to Egypt. Once across the border, they sought out other migrants for support, eventually connecting with groups living in the Cairo area. During their four years in Cairo, Hassan and Taher struggled to build a new life. Egypt had no formal refugee camps, and the youth could not register for asylum until UN officials visited the area in which they were staying. Once they had been designated as refugees, which entitled them to UN food rations, the teens continued to face discrimination. The UN worked to relocate some of the migrants, and both Hassan and Taher prepared to move to the third nation on their arduous journey: the United States. “The process for coming here is a tedious one,” said Abu, adding that the teens were investigated extensively by the U.S. Department of State and the FBI, which conducted two separate interviews with each. Once it was determined that neither Hassan not Taher had any family or friends living in the U.S., they were permitted to enter the country, and in April 2017, they were met at the Philadelphia airport by the CSS Refugee Resettlement team. “The CSS people simply said, ‘We are in Philadelphia, and we are working for you,’” said Taher. Since September 2017, CSS’s Refugee Resettlement Program has welcomed 84 migrants and refugees. Like Hassan and Taher, each refugee is thoroughly vetted by the federal government, and personally greeted at the airport by CSS staff and volunteers. Within 90 days of each arrival, CSS works to arrange housing, employment, schooling and bank accounts for families. CSS provides a stipend of $1,125 per person, of which $925 is applied to rent and $200 is designated as cash assistance. Each adult keeps $20 and opens a bank account with the remainder. Through the generosity of a volunteer, Hassan and Taher immediately found maintenance work at a local shipyard. But during the long days of cleaning, repairing and painting equipment, the young men — who had missed out on the opportunity to finish their education — yearned to stretch their minds through study. “They had the ambition to improve themselves,” said Abu, who connected Hassan and Taher with Job Corps, an educational and vocational training program operated by the U.S. Department of Labor for income-qualified youth aged 16 to 24. With campuses throughout the U.S., the program enables students to earn a high school diploma or GED certificate, along with certifications in a variety of professions. Yet at Job Corps’ Scranton-area facility, Hassan and Taher once again encountered racism. “The teachers were fine, but some of the students were really bad; they would bully you,” said Hassan. Even prior to their enrollment, the youth had been discouraged from pursuing more advanced educational and employment opportunities. The issue of developing migrants’ skills was highlighted in a December 2018 report by the UN and the Education Above All Foundation. The agencies found that immigrants generally work in positions far below their capacity, often due to a lack of recognition for professional credentials from migrant homelands, or an inability to document prior education for school-aged immigrants. Such “brain waste” hurts both migrants and their host countries: among immigrants with post-secondary degrees alone, the U.S. loses $10.2 billion in taxes from $39 billion in forfeited wages, according to the report. Despite the obstacles, Hassan and Taher persevered through their 18-month curriculum in office administration, bolstered by occasional weekend breaks away from the campus. Terry Hauger, who volunteers at CSS’s Chester location, invited Hassan to stay with him and his wife. “I really like these two guys,” said Hauger, a Chester resident and member of the Swarthmore Friends Meeting. Having just graduated from Job Corps with several certifications in Microsoft Office software, the young men have returned to the Chester area to look for employment and housing. For the present, Hassan is living with Hauger’s family, while Taher lives with friends of Hauger. “People say I’m being generous, but I get a lot from this,” said Hauger, who recalled that Hassan had been driven from Libya to the Egyptian border and left to make his way in the world as a teenager, without family or friends for support.